When it comes to flavored martinis, I’m a huge fan. In fact, I don’t think I’ve ever had a regular martini before. Yikes! One thing I’ve noticed is that with mixed drinks, almost every bar you go to will be slightly different in some way, just like with restaurants and food. Several months ago while on a girls weekend trip in Myrtle Beach, I strolled up the martini bar and looked over their menu. And if you ever have been to a martini bar, then you’ll know what I’m talking about when I say menu. As in, a 10 page menu of tons and tons of different flavored martinis. I can only pick one? I want all of them! Although an apple martini has been at the top of my favorites list for a long time, it has some major and serious competition now. I ordered one of these Snickers martinis last time at the martini bar, and thought it was quite yummy. Well, I don’t know what was different about that one and this one I made at home…but this one was ridiculous. I made it for a friend and myself, and as I handed over her martini, I took a sip of mine…and stopped. “Oh, WOW! This is awesome!” And you know how you’re technically supposed to sip martinis? Mine was gone in two minutes. Oh, and I was feeling it!! Holy cow! As I sat there staring at my friend’s drink as she sipped it, she looked at me and said, “Mine! Go make yourself another one!” I sheepishly smiled and headed to the kitchen to make another one…which was gone in another five minutes, and that was pacing myself. It was just way too stinkin’ delicious. 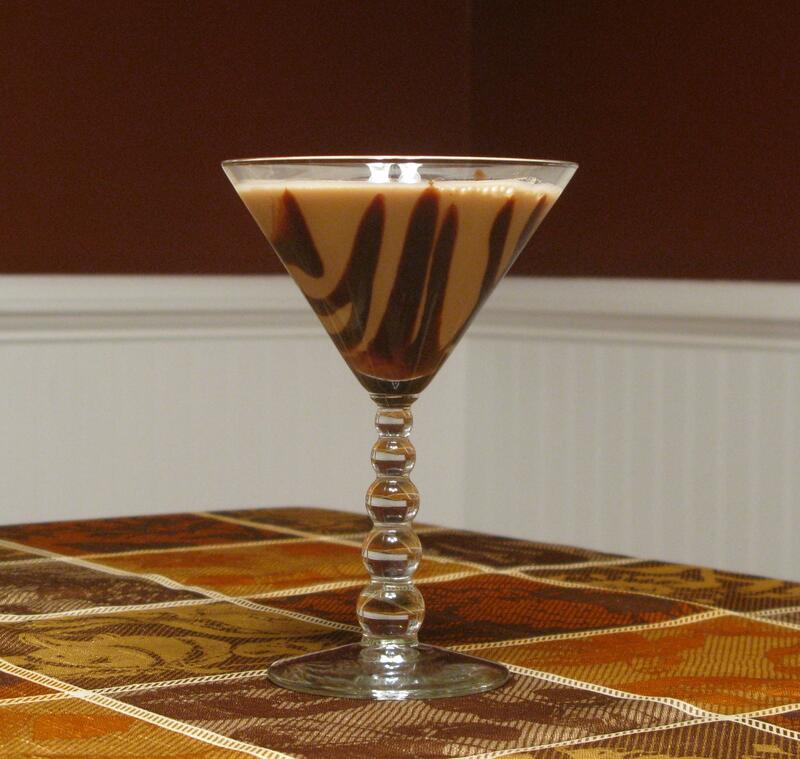 Drizzle chocolate syrup in martini glass. Fill cocktail shaker with ice, pour in all liquid ingredients. Cover, shake, and strain cocktail into martini glass.